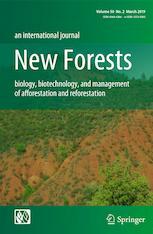 New Forests publishes original papers on fundamental and applied aspects of afforestation and reforestation for an international audience of scientists and practitioners. Articles discuss reproduction of trees and forests originating from seed, seedlings or coppice for resource protection, timber production, and agro-forestry. Coverage includes natural and artificial methods of regeneration and all stand structures from even-aged to uneven-aged. Topics include silviculture, plant physiology, genetics, biotechnology, ecology, economics, protection, and management of all stages of afforestation and reforestation. The Editor-in-Chief is Douglass F. Jacobs, Purdue University, USA.